Jack works with an assassin, bent on his destruction, in order to escape a creature who has swallowed them whole. 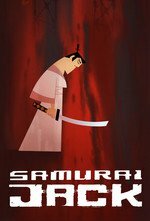 Thus far, this season of Samurai Jack has been elliptical and suggestive, even more than the original run of the show. Jack’s quest to find himself after decades of struggle has played out in brief glimpses of striking imagery, rather than anything as prosaic as a real conversation. But “XCV” puts him in the position of finally having to interact with someone for a prolonged period of time, and Samurai Jack finally gets to flex a few of its old comic muscles. I love how calmly annoyed Jack was dealing with Ashi. It's good it also went back to being funny instead of going all grim-dark. Yes. This was such a great episode. I loved it when he tied her loose below him during a climb instead of tighter on his back after she was affecting his actions and threw them off. This episode is amazingly pretty. When I first watched it I couldn't help but think "Okay, giant monster seems to mostly be an excuse to be able to draw all this stuff". Definitely worth it though. Also, when this series is done I'm definitely going to go back with an eye to the color palettes and backgrounds. Because the choices so far have definitely been meaningful and I wonder what this is going to look like in a larger context. This was a funny episode. Probably my favourite sight gag was unimpressed Ashi watching Jack argue with himself, while a bug creature sneaks up on her. Speaking of, Jacks hallucinations seem to be more personable this time out, which is a plus. Nice if slightly condescending English dust mote lady is a real improvement over On Fire Ghost Father or River of Unquiet Dead. One thing that occurred to me on a re-watch. How is Ashi going to deal with it when she's had her training unwound enough to see her sisters as people? Because from the training montage, the fact that they were pretty content to just leave the first daughter Jack killed as carrion and keep going, or the previous episode's brutal moment where one of the daughters just pulled her weapon back out of her dead sister's corpse, it's pretty clear that they didn't really conceptualize each other as people. Also, when this series is done I'm definitely going to go back with an eye to the color palettes and backgrounds. One of these days, I'm going to selectively post screenshots of the background art and character design, giving credit where credit is due, because I've been flabbergasted by some of the beauty in fleeting moments and really amused by a quick character shot (there was a living Christmas tree as a random character in a crowd in an earlier season! ), but this'll happen after I finish getting through Archer. One thing that occurred to me on a re-watch. How is Ashi going to deal with it when she's had her training unwound enough to see her sisters as people? That's a really interesting point. This episode showed her transition from single-minded assassin to someone who can appreciate the beauty of nature and see more fragile creatures as more than an inferior, weak beings that don't deserve any consideration. I wonder if they'll cope with her loss, and maybe she and Jack will find a way to mourn together, or if they'll become enemies again, for a different reason. While looking for that Christmas tree character, I found this tumblr post that speculates the Green Deer Horned Samurai is another hallucination of Jack, but of what he fears to become. It was posted back on March 19th, so it's a few episodes behind where we are now, but an interesting fan theory (and very nice fan art). When I first watched it I couldn't help but think "Okay, giant monster seems to mostly be an excuse to be able to draw all this stuff". That's funny, my girlfriend made almost exactly the same point when we were watching it. I don't know, that seems to suggest the pacing was off and it was just a bunch of pretty pictures. I thought it was one of the better episodes of the revived series. that seems to suggest the pacing was off and it was just a bunch of pretty pictures. Beautiful settings and well-paced storytelling can go hand-in-hand, and here they do. When you have different people who do their craft well, and they work together well, you get something you can experience repeatedly to take it apart and appreciate the details, as the details may also be hints at something more to come in the story. Or it could just be an excuse for really creative people to make beautiful art, which I also support wholeheartedly. FLT, Grimgrin said, "Okay, giant monster seems to mostly be an excuse (italics mine) to be able to draw all this stuff". Mind you, their subsequent "definitely worth it though" clarifies that Grimgrin felt like the episode worked, which I glossed over. If anything I was kind of indirectly arguing with my girlfriend, and making the same point you were. As long as they pull bits like where it rains actual pins and needles, they can get away with almost anything. Ursula Hitler, thanks for the clarification, sorry for mis-reading.